Thanks to David Taylor of xcnation.com for the following interview with Southlake Carroll HS senior runner, Ben Golestan. He is the 2nd. fastest 3200m. runner (9:15.27) on his team that is currently the fastest 5 x 3200m. team in the country with a 9:18.29 average. That average time ranks them 17th all-time on the list of the top teams which you can view at this link. During cross country, Southlake Carroll HS finished in 2nd place at the Nike Cross Nationals just four points behind the winning team. Passionate, motivated and dedicated are three words that I thought of during my career to keep me going, especially during injuries. You cannot excel at something without having passion and without it, it becomes a job. Motivation and dedication come afterwards but are just as important to success because staying at the top requires practice and repetition, which you cannot get by becoming complacent. Passion is the drive that every successful person needs. It let's them love what they do, even if it is difficult. No task was ever completed without a passionate drive to accomplish that goal. many? An example of something greater? where I am now. Setting an example for my team was always more important to me than individual finishes. It took me awhile to realize that, but it is the legacy I want to leave behind. I would tell them that nothing is going to come easy, no matter how talented they may be. That may be a bit off-putting, but it is the truth in regards to being a successful runner. Many great running talents disappeared due to injury or simple laziness. The ones that kept their focus and dedication are the ones that became great. Humility is one of the necessary human traits to being respected, both as a person and a runner. Based on experience, it is a bit lacking in the distance runner world, as I have been guilty myself. The best anyone can do is staying humble, no matter what kind of praise or attention they get, and let their actions, not words, gain them respect. That is a tough one. I suppose the one defining moment of my career was when the team got 2nd at Nike Cross Nationals (NXN). That was one of the most crushing moments in my life and it really left an impression on me. I had gotten a stress fracture in my left foot at the Nike Regional meet 2 weeks prior, so I had been cross training up to the National meet. I finished 7th on the team, once again not even breaking the top 100, which made it even more bitter since I knew if I had been healthy that day would have gone differently. My middle school offered an Off-Season program for kids who needed athletic credits without playing any real sports. Naturally, it consisted mostly of running laps around the school. After an entire year of this, there was a required mile time trial at the end of the year, which I ended up running 5:36. After this, some of my friends recommended I join the Cross Country in high school, and once I heard about NXN and the free Nike stuff, I was sold. Winning the state meet was by far THE highlight of my career since it was the first Cross Country boy’s title in school history. Besides that, running 9:15 at Texas Relays was awesome, as well as the first time I broke 16-minutes for the 5k my junior year at the Marcus I Invitational. around and seeing our next 3 runners finish right after us, knowing we had won. My family was not very involved in my running, mostly because I told them not to be. My parents went to all my races and took me to doctor’s appointments if I was injured or sick but they wouldn’t interfere with my diet or workouts. They trusted me to do the right thing and let me do my own thing. 12. Southlake Carroll coach Justin Leonard...how has he influenced your running, team? Coach Leonard was a great coach to have during my career, as it was a learning experience for both of us. My freshman class was his first class as a head coach, so we were his guinea pigs in the PAAVO program, which in the end turned out pretty well. He did a great job of keeping the team motivated and focused on the goal, which was winning state and nationals. Favorite distance would have to be the 800 which is surprising for a distance runner but it was the most enjoyable race I do on the track. My favorite run would be our Monday long runs around the city, nothing helped you relax like those 13 mile morning runs. 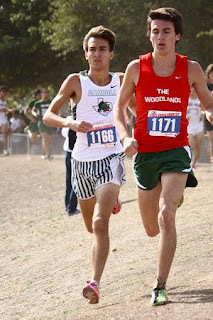 Favorite invitational would be the Marcus I Invitational, and I am sure most runners from my area would agree with me since it is such a fast course. My favorite opponent would be Brigham Hedges from The Woodlands, seeing him in front of me in races would force me to go catch him no matter how bad I was feeling. Favorite track workout would be the 10x400 repeats I did every Tuesday during cross country season, that workout made men out of boys. My season ended last weekend, a little earlier than I would have hoped. However, the races I looked forward to most were Texas Relays, District and Regionals. That is a very difficult question, since my running and personal life took very different paths. I was a motivated and focused runner, something not present in my school work. I think everyone would define me differently, but I would like them to think of me as honest, a good friend. Favorite running movie is easily Chariots of Fire, can’t compare to that. Favorite running song would have to be “Oh!” by Union Turnpike. Favorite runner is Hicham El-Guerrouj, I love watching his old races.